Family-friendly apartment with a small terrace. The apartment "Family" is 70 square meters and with its 3 rooms an ideal apartment for a family with children. It is located on the lower floor of the house. The apartment has a large living / dining area with well equipped open kitchen. In the double bedroom you will find a large closet for all your belongings. The small bedroom has two single beds. For a fifth person, the sofa bed can be folded out in the living room. There are two toilet rooms: one with toilet and shower, the other with toilet, sink and washing machine. The living room has a powerful air conditioning, which is sufficient for both bedrooms. All rooms are equipped with ceiling fans. The windows are fitted with fly screens and electrically operated blinds. All rooms can be centrally heated in the colder months. Before the apartment there is a 18 square meter private terrace, which is accessible via a few steps. It is located on no road and is ideal for children to play. 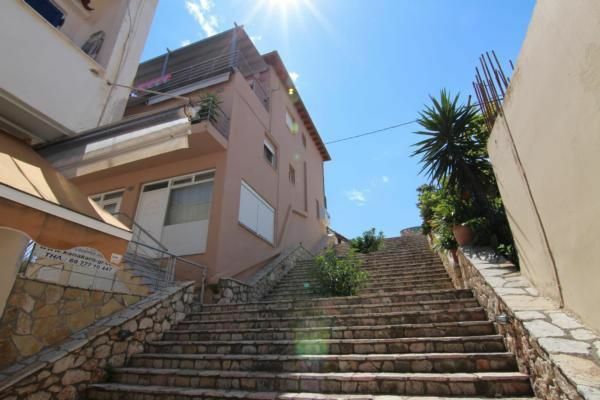 A picturesque staircase leading to the street and the sea leads to the apartment. Derveni (Δερβένι) is a typical Greek coastal village in the prefecture of Corinth in the Peloponnese. Many Greeks from Athens and Patras have their holiday homes in Derveni. It is characteristic that the houses line up along the whole coast, and where the one village stops, the next one begins. Derveni is located directly on the sea. Nestled between the Gulf of Corinth and the slowly rising mountains. After only a few minutes drive you can reach traditional mountain villages (eg. Zarouchla, Sarantapicho) and crystal-clear mountain lakes (eg Doxa, Tsivlos), which are worth a day trip. In the village there are numerous taverns, ouzeries and small shops for daily needs. An internet café is right next door. WiFi internet access is available free of charge in every café / bar / restaurant in the village.